"Web site password enclosed." Imperfect copy. Includes bibliographical references and index. 2008-02-08. Good. Ships with Tracking Number! INTERNATIONAL WORLDWIDE Shipping available. May not contain Access Codes or Supplements. May be ex-library. Shipping & Handling by region. Buy with confidence, excellent customer service! Wiley. Hardcover. 1118206738 New Textbook, Ships with Emailed Tracking from USA . New. 2013-01-01. New. Ships with Tracking Number! INTERNATIONAL WORLDWIDE Shipping available. Buy with confidence, excellent customer service! 2015-12-21. New. Ships with Tracking Number! INTERNATIONAL WORLDWIDE Shipping available. Buy with confidence, excellent customer service! 2009-09-06. New. Ships with Tracking Number! INTERNATIONAL WORLDWIDE Shipping available. Buy with confidence, excellent customer service! 2016-06-02. New. Ships with Tracking Number! INTERNATIONAL WORLDWIDE Shipping available. Buy with confidence, excellent customer service! 2015-12-21. Good. Ships with Tracking Number! INTERNATIONAL WORLDWIDE Shipping available. May not contain Access Codes or Supplements. May be ex-library. Shipping & Handling by region. Buy with confidence, excellent customer service! Wiley. Hardcover. 0470483377 New Textbook, Ships with Emailed Tracking from USA . New. 2016-06-02. Good. Ships with Tracking Number! INTERNATIONAL WORLDWIDE Shipping available. May not contain Access Codes or Supplements. May be ex-library. Shipping & Handling by region. Buy with confidence, excellent customer service! John Wiley & Sons Inc, 1999-08-01. 2nd Packag. Hardcover. Used:Good. 2007-07-05. New. Ships with Tracking Number! INTERNATIONAL WORLDWIDE Shipping available. Buy with confidence, excellent customer service! 1998-03-07. New. Ships with Tracking Number! INTERNATIONAL WORLDWIDE Shipping available. Buy with confidence, excellent customer service! 2007-09-21. Good. Ships with Tracking Number! INTERNATIONAL WORLDWIDE Shipping available. May not contain Access Codes or Supplements. May be ex-library. Shipping & Handling by region. Buy with confidence, excellent customer service! Good. Bound Loose Leaf Edition. Wiley, 2015. Paperback. New. 7.1 x 5.2 cm. Wiley, 2013-01-22. Loose Leaf. Used:Good. 2002-04-06. New. Ships with Tracking Number! INTERNATIONAL WORLDWIDE Shipping available. Buy with confidence, excellent customer service! CELL AND MOLECULAR BIOLOGY - TAKE NOTE! 2010-07-20. Good. Ships with Tracking Number! INTERNATIONAL WORLDWIDE Shipping available. May not contain Access Codes or Supplements. May be ex-library. Shipping & Handling by region. Buy with confidence, excellent customer service! John Wiley & Sons Inc, 2013-05-10. Paperback. Good. 2002-06-07. New. Ships with Tracking Number! INTERNATIONAL WORLDWIDE Shipping available. Buy with confidence, excellent customer service! New York: Wiley 2004. (Wiley I, 2004-01-01. Paperback. Used:Good. John Wiley & Sons Inc, 1999-08. Hardcover. Good. John Wiley & Sons Inc, 1999-06-01. 2nd Packag. Hardcover. Good. New York: John Wiley & Sons, 2010. Hardcover. Very Good. 765 pages. 6th Edition. Wiley. Hardcover. 1118206738 US Edition Textbook, May Have Highlights, Notes and/or Underlining, BOOK ONLY-NO ACCESS CODE, NO CD, Ships with Emailed Tracking from USA . Good. 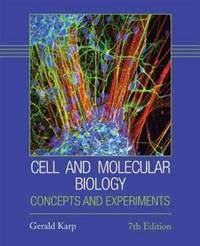 Cell and Molecular Biology: Concepts and Experiments Take Note! John Wiley & Sons, 2007. This is an ex-library book and may have the usual library/used-book markings inside.This book has soft covers. In good all round condition. 2007-03-05. Good. Ships with Tracking Number! INTERNATIONAL WORLDWIDE Shipping available. May not contain Access Codes or Supplements. May be ex-library. Shipping & Handling by region. Buy with confidence, excellent customer service! 1996-02-05. Good. Ships with Tracking Number! INTERNATIONAL WORLDWIDE Shipping available. May not contain Access Codes or Supplements. May be ex-library. Shipping & Handling by region. Buy with confidence, excellent customer service! Wiley, 2013-01-22. Softcover. New. ***International Edition***Soft cover/Paperback*** Textbook printed in English. ***Brand New***. Most international edition has different ISBN and Cover design. Some book may show sales disclaimer such as "Not for Sale or Restricted in US" on the cover page but it is absolutely legal to use. All textbook arrives within 5-7business days. Please provides valid phone number with your order for easy delivery. Wiley, 2007-02-01. 5. Hardcover. Used:Good. John Wiley & Sons, 2004. This is an ex-library book and may have the usual library/used-book markings inside.This book has hardback covers. In good all round condition. Wiley, 2013-01-22. 7th Edition Binder Ready Version. New. New, unread, and unused. 2002-06-07. Good. Ships with Tracking Number! INTERNATIONAL WORLDWIDE Shipping available. May not contain Access Codes or Supplements. May be ex-library. Shipping & Handling by region. Buy with confidence, excellent customer service! Wiley, 2007-02-01. 5. Used - Like New. Book pages are in new and unused condition. May have a remainder mark. Cover damaged- either normal shelfware or small tear/wrinkle on front or back cover., Used Like New, no missing pages, no damage to binding, may have a remainder mark.